Lamps & Lighting Ltd. would like to inform our valued customers and stakeholders of changes within our company. 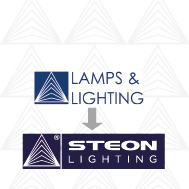 As of February 1st 2017 we shall be changing the name of Lamps & Lighting and shall conduct our business under the name of Steon Lighting. Making the decision to change the name of our company has not come lightly, however, we feel it is necessary due to recent technological advances and market forces that have resulted in a dramatic shift in the lighting market. With the increased adoption of solid-state light sources, namely LED, traditional lamps have fallen out of favour. As we have adapted to this change and diversified into manufacturing LED luminaires, our company name ‘Lamps & Lighting’ has become increasingly misleading and outdated. Steon is the name of our most prolific brand and is a natural progression for our company. It is at this point, with the imminent release of our 9th Edition catalogue, that we have chosen to begin the process of adopting this brand name as our company name. We would like to reiterate to our customers and stakeholders that the only thing that will be changing is our trading name – we will have the same incorporation number, registered office, ownership, management, staff, products, service and heritage as over the past 46 years! For more information about our rebrand, please contact us at marketing@lampslighting.co.uk or alternatively call our office on 01282 448666.